Abstract: Reassessing dose constraints of organs at risk in children with abdominal neuroblastoma treated with definitive radiation therapy: a correlation with late toxicity. Abstract Publish Date: December 24, 2014. In children treated with definitive radiation therapy (RT) for abdominal neuroblastoma, normal tissue constraints for organs at risk (OARs) are not well-standardized or evidence-based. In this study, we analyze dosimetric data of principal abdominal OARs, reassess existing RT planning constraints, and examine corresponding acute and late toxicity to OARs. The treatment plans of 30 consecutive children who underwent definitive RT for high-risk abdominal neuroblastoma were reviewed. Dose-volume histogram (DVH) statistics were recorded for the ipsilateral kidney (if unresected), contralateral kidney, and liver. DVH data were analyzed to determine if OAR constraints from recent protocols were met and correlated with the development of toxicity. The median follow-up period was 53.0 months. Ten, thirteen, and ten percent of patients’ RT plans did not meet OAR DVH constraints for the liver, ipsilateral kidney, and contralateral kidney, respectively. Of the three patients whose plans did not achieve ipsilateral kidney DVH constraint(s), two developed evidence of late ipsilateral kidney hypoplasia, but maintained normal laboratory kidney function. No patient experienced late toxicity of the contralateral kidney nor developed RT-related late hepatic complications. In children treated for abdominal neuroblastoma, the risk of developing clinically significant RT-related late toxicity of the kidney and liver is not appreciable, even when current DVH parameters for OARs are not achieved in planning. Toxicity outcomes did not necessarily correlate with present-day OAR dose constraints. Currently utilized DVH constraints are highly variable, and must be further studied and supported by toxicity outcomes to more accurately characterize risk of complications. 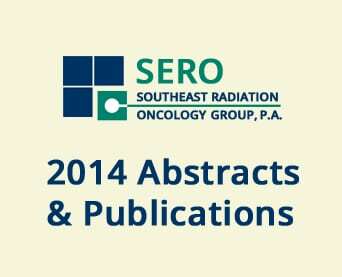 Pediatr Blood Cancer © 2014 Wiley Periodicals, Inc.
https://treatcancer.com/wp-content/uploads/2015/01/SERO-Blog-Featured-ImagesJPG.jpg 277 342 Southeast Radiation Oncology Group, P.A. https://treatcancer.com/wp-content/uploads/2015/08/SERO-logo-PNG-450x174.png 2015-02-18 04:07:512018-10-17 19:28:07Abstract: Reassessing dose constraints of organs at risk in children with abdominal neuroblastoma treated with definitive radiation therapy: a correlation with late toxicity. How to Reduce Risk of Prostate Cancer When should I get a prostate exam?